The Convention on International Trade in Endangered Species of Wild Fauna and Flora (CITES) is an international agreement between governments. The CITES aim is to ensure that international trade in specimens of wild animals and plants does not threaten their survival. CITES remains one of the world’s most powerful tools for wildlife conservation through the regulation of the trade. Thousands of species are internationally traded and used by people in their daily lives for food, health care, housing, tourist souvenirs, cosmetic or fashion. CITES regulates internationally trade over 36,000 species of plants and animals, including their products and derivatives, to ensure their survival in the wild with benefits for the livelihoods of local people and the global environment. The CITES permit system seeks to ensure that international trade in listed species is sustainable, legal and traceable. The CITES was signed in Washington D.C on March 3, 1973 and entered in to force on July 1, 1975 as of June 30, 2018 there are 183 Parties(182 Countries + European Union) to the CITES. CITES works by subjecting international Trade in Specimens of selected species to certain controls. All Import, Export, re-export and introduction from the sea species covered by the convention has to be authorized through a licensing system. Each party to the convention must designate one more management authorities in charge of administering that licensing system and one or more scientific authorities to advise them on the effects of trade on the status of the species. National Laws for implementing CITES are Critical to ensure that trade in protected species id legal, sustainable and traceable. Legislation empowers government officials to act, regulates human behaviour and articulates policy in relation to conservation and trade in Wildlife. CITES cannot be fully implemented until specific domestic measures have been adopted for that purpose. It is therefore absolutely essential that CITES Parties have legislation in place allowing them to implement and enforce all aspect of the convention. * Category-2-Legislation that is believed generally not meet all of the requirements for the implementation of CITES. 21.9% or 40 Parties. * Category-3-Legislation that is believed generally not to meet the requirement implementation of CITES.19.1% or 35 Parties and recent parties 3.8% or 7 Parties. Appendices I. II and III is to Convention are lists of Species (fauna and flora) which are afforded different levels or types of protection from over- exploitation. Appendix I-Species threatened with extinction. Trade in specimens of these species are permitted only in exceptional circumstances. As of January 2, 2017, there are 34,569 species and 12 subspecies listed. Appendix II - Species not necessarily threatened with extinction, but in which trade must be controlled in order to avoid utilization incompatible with their survival. As of January 2, 2017, there are 34,569 species and 12 subspecies listed. Appendix-III Species that are protected in at least one country, which has asked other CITES parties for assistance in controlling the trade. Changes to Appendix III follow a distinct procedure from changes to appendices I and II, as each Party’s entitled to make unilateral amendments to it. As of January 2, 2017, there are 202 species, 14 subspecies and I varieties listed. Sri Lanka acceded to the CITES Convention on May 4, 1979. Since then as a Party to the CITES for nearly four decades, Sri Lanka is yet to introduce national laws implementing CITES in the country. Currently Sri Lanka is placed in Category 3, which is for Parties that do not meet the requirements for the implementation of CITES. Wildlife advocates of Sri Lanka urge and advocate the Sri Lankan authorities to introduce required legislation followed by regulations to implement CITES at a national level. Having local regulation in place to implement CITES in Sri Lanka will help not only to protect its own wildlife smuggled out of the country but also join hands with the international community to apprehend wildlife trafficking taking place at Sri Lankan ports, airports and in Sri Lankan waters. It is vital to note that national laws will always supersede any CITES regulation. This means that existing laws would not be weakened while CITES would help close loopholes that enable Sri Lanka to be used as a wildlife trade route. CITES would also better regulate trade for species from other countries (eg. Blood ivory from Africa), trade of orchids, timber and marine products (like shark fins); all of which have management controls in place at present but are still being traded in large volumes. CITES is one of the Conventions that comes under the European Union’s (EU) Generalized System of Preferences Plus (GSP+) that provides additional trade incentive to developing countries including Sri Lanka. Sri Lanka lost the GSP+ in 2010 and regained it in 2017 promising to the EU that Sri Lanka would adhere and implement the Conventions under GSP+ consideration. Sri Lanka’s Fauna and Flora Protection (Amendment) Act, No. 22 of 2009 and Customs (Amendment) Act. No. 2 of 2003 or other legal instruments do not provide adequate legal provisions for apprehending illicit wildlife trafficking that is taking place in Sri Lanka, in transiting and beyond the Sri Lankan waters. In the recent past most of the illicit wildlife trafficking cargos transited via Sri Lanka were detected and detained by other East Asian countries. At the same time, in recent years, wildlife specimens are being taken in and out of Sri Lanka at a very high rate. Under available legal provisions stipulated in the Customs Act of Sri Lanka and with available limited resources, Sri Lanka Customs is working hard to detect illicit wildlife trafficking at the country’s exit points (ports and airports). It is worth noting that the recent two biggest wildlife-related detection by the Sri Lanka Customs received international attention. In 2012, Sri Lanka Customs forfeited the African Blood Ivory container which was in transit to Dubai and in 2014 held 28 containers of rose wood from Tanzania which was in transit to East Asia. For the first time in the South Asian region Sri Lanka destroyed a blood ivory container on January 26, 2016. John E. Scanlon, Secretary General of CITES came as a special guest of Sri Lankan Government on this occasion. He was the first CITES Secretary General to visit the South Asian region. Scanlon applauded the Sri Lankan authorities for forfeiting such a massive blood ivory haul and taking steps to destroy it publicly. This event brought a high degree of international positive media attention to Sri Lanka, rivalling any event since country’s independence in 1948. During Scanlon’s visit to Sri Lanka he had a discussion with Sri Lanka wildlife authorities on the local regulation for implement CITES in Sri Lanka. He emphasized the importance of having CITES local regulation in place and working towards achieving Category 1 status from the current Category. 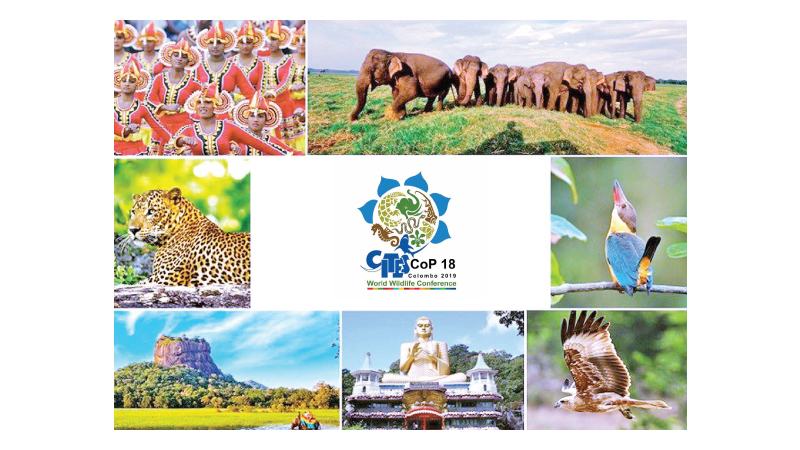 Hosting CITES CoP 18 will be a major and significant international gathering in Sri Lanka, with 183 Parties, consisting of 182 countries attending. India hosted CoP 3 of the CITES in 1981. After 38 years, Sri Lanka will host CITES in the South Asian region once again.